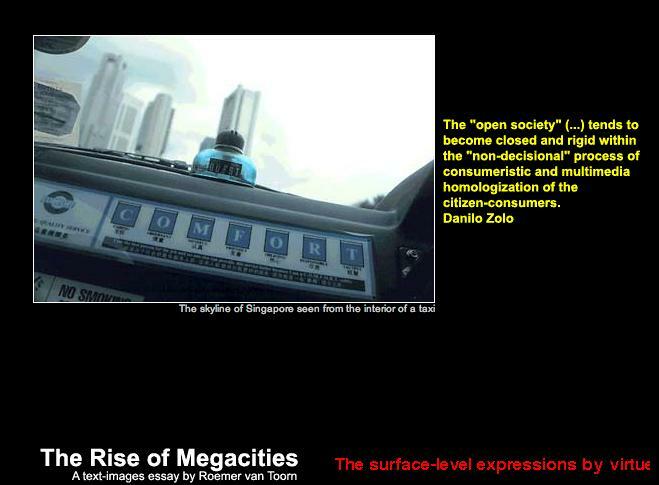 When you click The Rise of the Megacity by artist Roemer van Toorn, in the website window below the image to your right, you can experience interactively what the Rise of the Megacity exhibition was about. Photos by Roemer van Toorn are combined with quotations from sociologists, architects, political scientist and Van Toorn himself. The texts appear when you move you rmouse pointer on each photo. The exhibition was curated by Rafael Gomez Moriana & Plug IN Gallery, Winnipeg, Canada, 1999.